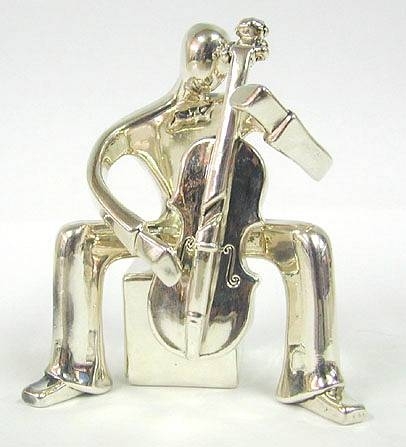 Sterling Silver Cello Player Figurine Wonderful artisan sterling silver Cello player figurine. Beautifully executed in artistic design as a cello player sitting on a cubic chair and playing the cello. 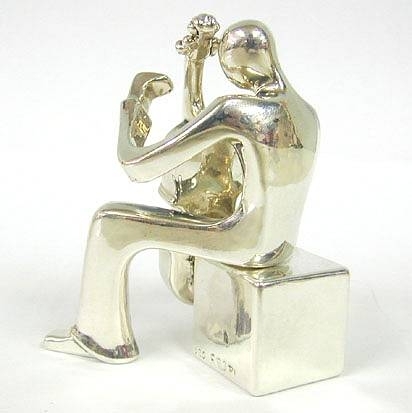 The figurine is comprised of two parts as seen in the pictures. This item was made in the electroforming method. Measurements: Height: 3.1in. / 7.874cm. Width: 2.6in. / 6.604cm. Length: 1.9in. / 4.826cm. Weight: 52gr. / 1.672oz. Marks: 925 for sterling silver.